Learn How to Command the Room, Connect With Your Audience, and Close the Deal With Laura Sicola’s "Maximize Your Leadership Influence"
CUPERTINO, CA (PR Buzz) – June 11, 2018 – – We all know the expression, "It's not what you say, it's how you say it." If you want to be a true master of influence, you need to work on both what you say and how you say it. Leadership is not just a role, it's an image. If you are a leader, the way you communicate with the people around you will either "make" or "break" your image as a leader in people's minds. It's important that you learn how to speak clearly and concisely in order to get your point across. The way you speak has to show that you are an expert or else, people won't buy into what you say. You need to captivate your listeners, not make them feel like captives being forced to listen to you. Most importantly, your delivery needs to inspire people to get on board with your vision. Dr. Laura Sicola is a professional speaker and leadership communication coach and the founder of Vocal Impact Productions in Philadelphia, PA. She is known for her coaching and live on-camera trainings that turn C-level executives and other leaders into master influencers who get to yes and close the deal. Her mission is to help people project their best leadership image; create loyal, effective teams; and establish their ideal corporate culture by mastering "The 3Cs" of Vocal Executive Presence: Command the room, Connect with the audience, and Close the deal. Dr. Sicola recognizes that executive presence and strong leadership communication skills are fundamental to success, regardless of one’s formal role or position. Hardcover, paperback, and Kindle versions of this book are available on Amazon. From June 4 to June 8, you can download the Kindle version of this book for free! 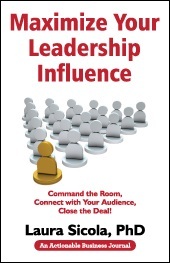 Save the date and grab your copy: getbook.at/LeadershipInfluence. Read and share amazing AHAmessages from "Maximize Your Leadership Influence" by going to http://aha.pub/LeadershipInfluence. To learn how to share AHAmessages from this book, check out this video: https://youtu.be/DGXr4VBrhZQ. To learn how automatically share via AHAblaster, please watch: https://youtu.be/Llmis7w0L54.